There are countless topics that people are chattering about at work, at the coffee shop, at the book store and online. You hear them everywhere you go and you wonder if whatever they’re talking about should concern you. You know what the topics are. Things that are keeping people awake at night or wondering if anything needs to be done about it. Stupid topics that your friends are posting on their Facebook wall because they saw a homemade video on YouTube with pictures of the world coming to an end. Things that you want to comment on but didn’t. On this web site, you will have the opportunity to speak your mind about these concerns. Don’t worry, no one will judge you (hmm, that may be another topic) because we want your honest opinion and your thoughts. We will have all kinds of topics to talk about here, anything from your dog rubbing on the carpet to UFOs invading earth; from teenagers sexting their friends to earth quakes; from 911 conspiracy theories to road rage; from your car making funny noise to massive weather changes; from gas prices going up to the US dollar going down; from 2012 end of the world to dropped calls on your cell phones; from being direct and honest to your spouse cheating on you. 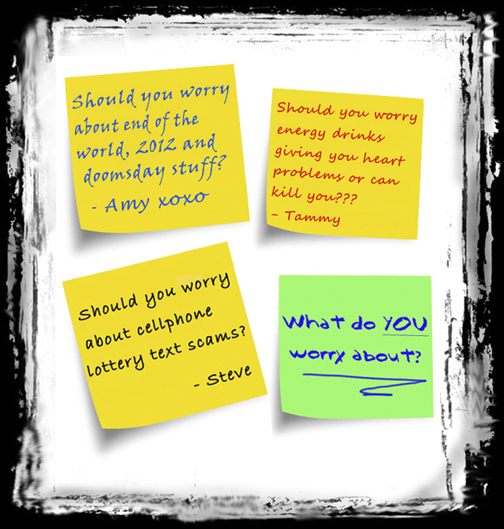 Feel free to start a new topic by clicking on the link at the top of the page called ‘What Do You Worry About’ or the green sticky note and let others comment! Let this be the portal for all ‘Should You Worry’ concerns.